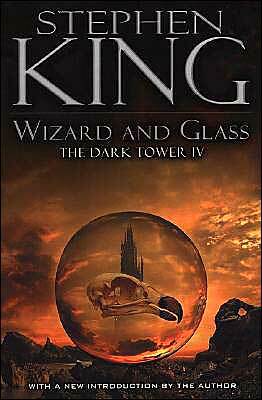 In the afterword to this the fourth novel of Stephen King’s Dark Tower series, King says that writing a love story is much more difficult than writing suspense and that he put off this story as long as he could. Well, if the task was difficult, you certainly wouldn’t know it from reading the novel. This is, so far, my favorite of the series. Wizard and Glass is mostly back story, recounting Roland’s first adventure as a new gunslinger with his first ka-tet, the always self-amused Cuthbert and the sensitive peacemaker Alain. The three are sent far from Gilead by Roland’s father to a small sea town at the edge of Mid World called Mejis. John Farson, or the Good Man, has been gathering an army to confront Gilead, and Roland’s father sends the boys away in hopes of protecting them from the gathering storm. Ironically — or perhaps because of ka — Roland and his companions find themselves smack in the middle of John Farson’s plans: the rancher’s association of Mejos is in cahoots with Farson and, with the help of some bad-blooded reject gunslingers known as the Big Coffin Hunters, are gathering fuel and horses to supply Farson’s army. Meanwhile Roland has fallen for Susan Delgado, a local girl promised to the town’s elderly, married mayor. I won’t give away any more than that. This is too great of a story to spoil. You’ve got to read it for yourself, knowing that you’ll likely experience the full range of emotions as you’re sucked into what we know is a story that can’t end well. How did Roland become the hardened man he is? Why did he become obsessed with the Tower? Book IV may not answer those questions completely (there are still three books to go, after all), but it does broaden our understanding of the man who may very be the greatest cowboy/knight to have ever graced the page or screen. And coming from a die-hard John Wayne fan, that’s saying a lot. Defending People » Nope, No Balm in Gilead. Sorry.